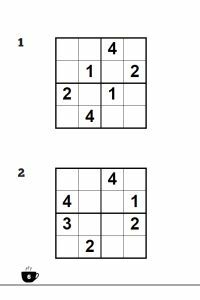 Looking for a sudoku that does not require the concentration of a 9x9 grid? 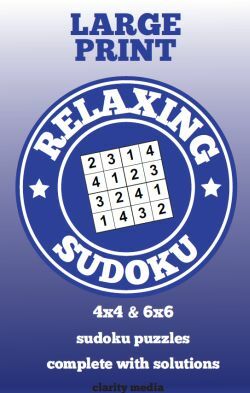 Large print Relaxing Sudoku contains 100 puzzles with 36 small 4x4 grids and 64 6x6 grids. This selection of puzzles is intended to provide a relaxing and enjoyable experience for young and old minds alike. Printed in large print with 2 puzzles per page, the puzzle experience can now be a relaxing one. Perfect for beginner sudoku fans or those looking for something a little less strenuous. If you're based in Europe but outside the UK, then this book is also available on the version of Amazon in your country. 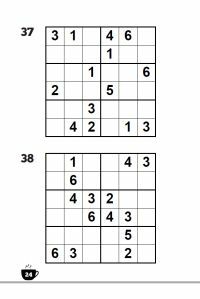 Standard sized sudoku puzzles are great, but sometimes we all feel like we just want something simpler and quicker to solve. There are all sorts of reasons why this might be the case: perhaps you only have a few minutes to spare, don't feel like concentrating for a long time or are unable to - for instance when recovering from an operation. Whatever the reason, if you're looking for quicker, easy to read sudoku then large print relaxing sudoku could be the book for you. The book starts with 4x4 puzzles where you place 1 -4 once in each row, column and 2x2 box. Then come the 6x6 puzzles where you need to place 1-6 once in each row, column and 3x2 box. These puzzles are also ideal for the beginner who is learning sudoku for the first time, before graduating to the larger 9x9 puzzles. The sudoku puzzles are printed on good quality white paper, perfect to be written in with pen or pencil (we would recommend pencil in case of mistakes and also it makes pencilmarks easier). So grab a cuppa, open the book of large print relaxing sudoku, and enjoy a satisfying but quick solving experience. If you are a publisher looking to purchase puzzles for publication, or a license to use material from our books, please use this Contact Form to get in touch. For individuals with comments, questions or ideas with regard to our puzzle books, or if you would like to request a personalised version of any book (eg Daniel's Book of Sudoku) then please use this Contact Form to drop us a line.